Also, let me clarify terminology: Hope is a service dog. That is different than a therapy dog. A service dog is meant to guide and assist a person with a disability to navigate the environment at home and in the community. A service dog is a highly trained animal that is allowed by federal and state laws in any public place. They are assigned to one individual for their role as a lifetime assistant to the person with the disability. A therapy dog is meant to assist with emotional or psychological stress associated with disability or trauma. These animals help patients work towards specific physical, social, cognitive or emotional goals. 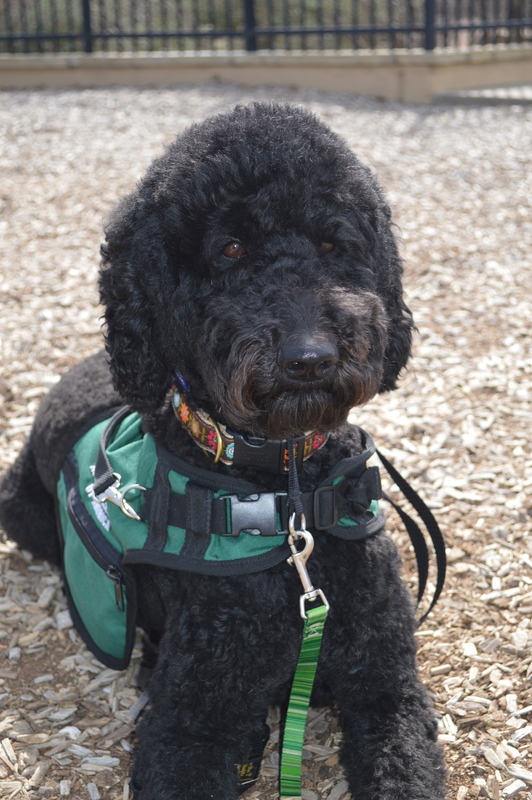 A therapy dog is not usually assigned to just one person. They generally work in facilities like hospitals, nursing homes, schools or psychiatric offices to help many patients. If you have a well-trained pet with a very calm demeanor, this kind of full-grown dog can be trained to be a therapy dog. During her training, Hope learned the difference between the times when she has her service pack on and when it is off. When her service pack is on, she is on the job. She knows this and will always exhibit exceptional behavior as well as a rock-solid calm demeanor. She is not distracted by other animals or food and she remains focused on her boy at all times. She knows her job and she takes it seriously. But, when her pack comes off, she is just a well-trained house pet. She runs around the yard, barks at squirrels, plays with the kids or other dogs and loves chewing on bones while she relaxes on her dog bed. It is important for us, as a family, to help find the balance between giving her “time off from work” and still remaining calm to maintain her calm demeanor. That is a challenge in my household, but we are working on it. When she is wearing her service pack, no one is allowed to pet her besides Gray or the adult who is her handler. This is a hard one for people to understand. I hate telling people “no” when they ask to pet her. I especially hate telling people to stop when they have already touched her without my permission. I do it anyway, though. It’s important to keep her focused on her job. I tell people, “how well could you do your job or school work while a stranger patted you on the head?” I hate to appear rude, but I’ll be damned if I will let an eager dog-lover ruin the very expensive and time consuming training that she has mastered. We did not name Hope. ASDA received puppies in groups from various breeders. Each group of puppies are roughly the same age and start training at the same time. This allows ASDA to hold regular training sessions for the puppy raisers that will be relevant to everyone at the same time. In order to keep the groups straight, ASDA names the puppies in alphabetical order so that all of the dogs in the group have names that start with the same letter. Hope was part of the “H” class. It is pure serendipity that we received a dog with such an appropriate name. We could have just as easily ended up with Heidi, or Hazel, or Haley or Hunter. But, we didn’t. We got Hope. The perfect dog for Gray. Thought about giving this info earlier but never have. Think you will have an even greater appreciation of Hope after this. I am Hope’s breeder and she was actually part of a surprise litter…well suprise to me but not to our Maker. Hope and Heidi are sisters and believe it or not, when people came to look at puppies and be interviewed and make an application, no one espressed an interest in either of these girls. It was breaking my heart in some ways but I always pray for guidance for the placement of each pup and for each family that gets one of our pups so I held onto that thought and knew that the right family would come along. At about 4 months of age, ASDA contacted me because they had been reading my blog on my website and the training that we were doing with the pups. They were interested in checking out the girls as possible Service Dogs and well,…the rest is history. (And a lot of love from everyone involved in her life and training) Hope and Heidi started out a little later than many of the other dogs but they each have a wonderful heart and spirit for their families and the work they do. Keep up the amazing job that you do daily with your family – the 2-leggeds and 4-leggeds alike! It’s so amazing to read about Hope and how she is able to help Gray. I have two boys, both have autism, although higher functioning than Gray in a lot of ways. They are both verbal (were quite delayed, especially my older son), but do not “get” people, no understanding of danger, meltdowns, sensory issues, etc. My older son is 21 and has come a LONG way (he was also born with kidney failure and is now 16 years post transplant). I had thought about an autism service dog for him, but it never worked out. Now I’m looking into it a bit closer for my younger son. He is 7. Very smart, but just does not see the world the way the rest of us do. He is verbal, but has a lot of trouble getting across what he wants to say, understanding what you are telling him, etc. Mostly it’s the meltdowns and such. He is not a “runner” but is a “wanderer” Even in our house, I have to check on him if he’s out of my sight for more than a few minutes, because I don’t know what he might be doing or if he’s in danger. I’m sure you totally understand that! He is now afraid to be away from people (especially me). He won’t play in his room on his own anymore, he has to be in the same room as one of us. He won’t stay in his bed at night anymore. I wonder if an autism service dog might be able to provide him more than just the safety issues. Can they be trained to “sense” meltdowns like seizure dogs can sense seizures? Can they be trained to lay down on the child to provide deep pressure and sensory input that the child needs when upset? I don’t know that we could ever come up with the money for this, but I guess it’s a dream. We can’t even get him all the therapy he needs, the copays add up way too fast and we are only allowed 30 therapy sessions a YEAR….so we try to spread them out. I was hoping maybe I could find a way to fundraise, but then saw that you also need to pay for the trainer to come to your hometown for that part 2 of training, that really worried me. I have no clue how much more that would cost. Would they insist on flying, could they drive? How inexpensive of a hotel would they tolerate? My family is spoiled when we get to stay at a Days Inn or something! Super 8 and Motel 6 are usually where we end up. Flying anywhere is just no an option anymore either. Do you any advice? We live in Montana, which is no where near ANY of the places I’ve found that train autism services dogs. Any help would be much appreciated!! Hi Shelly. I would definitely recommend you contact ASDA to discuss your specific needs and goals for your son. They are great with answering questions and helping you get an idea of whether or not this might be the right direction for your family. Send an email to them (or you could even copy and paste what you just wrote here). The email address is info@autismservicedogsofamerica.org. I promise you will get a speedy reply! I met Hope and Gray on a flight from Chicago to Dallas. It was an amazing experience. Gray is a gorgeous boy , he was so good. Put a smile on my face because he just expresses what the rest of us are thinking and don’t express. Hope is beautiful such a sweet soul . I have anxiety and have trouble containing it during bumpy flights, it was my first time traveling alone in a long time. Having them both there was a blessing and surprise for me. I thank God for them both , that their little appearance in my life has a bigger impact then they knew or may ever realize. May God keep blessing yous all , and may you all continue to be a blessing to others.